In 1959, organized lacrosse was officially started in California when the California Lacrosse Association was formed, representing two high school teams, one college team, and one club team. While there are reports that lacrosse was played at the University of California, Los Angeles during the 1950s, an official lacrosse team was not organized until the fall of 1969 through the efforts of Bob Henry, the Club Sports Director in the office of UCLA Cultural and Recreational Affairs, along with Al Saviano and Bill Shoop. Saviano provided some members of the new club with enough wooden sticks and equipment to field a team in the first year of play. The head coach for the inaugural Bruin lacrosse season was Stan Blum. The first two UCLA teams were lucky enough (or, unlucky) to play the Air Force Academy (the first collegiate varsity program west of the Mississippi). Despite the fact that both meetings resulted in bad losses for the Bruins, the standard was set for the team and the seeds of something great were sown in Westwood. 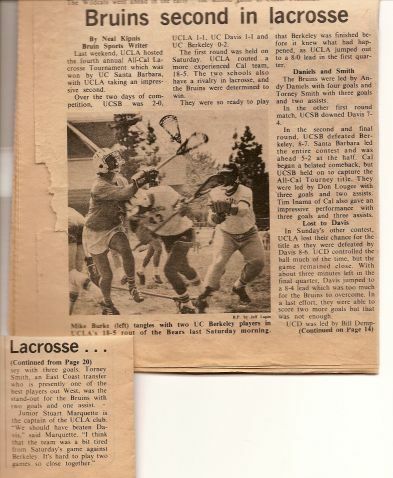 The arrival of Mayer Davidson in the fall of 1969 ushered in a new era for UCLA lacrosse. As a young faculty member of the medical school, Davidson played under Blum for a few seasons before taking over the program as player-coach. Davidson is credited for bringing a talented Bruin team together. 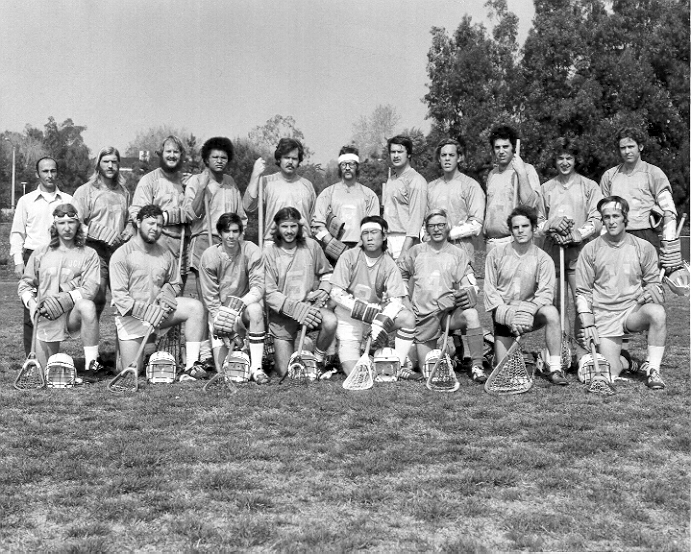 In the early 1970s the UCLA Men's Lacrosse Team was a member of the California Lacrosse Association. The team competed against other local college teams (including their original rivals, UC Santa Barbara and California) as well as men's post-collegiate clubs that comprised the CLA. Davidson brought team play to a new level and his players remember his imaginative man-up schemes to this day.In 1972 the UCLA team defeated a L.A. Lacrosse Club loaded with Hall of Famers and was regarded as the top team in southern California. Davidson retired from playing in 1976, but continued coached the Bruins until 1978 leading the team to a 9-4 record and two wins over crosstown rival USC in his final full season. In 1978, UCLA , UC Santa Barbara, University of California, Stanford University, University of Arizona, Arizona State University and the Claremont Colleges became founding members of the Western Collegiate Lacrosse League (WCLL). In the early 90s the WCLL split into Northern and Southern Divisions. UCLA was a member of the Southern Division A along with UCSB (at times! ), Loyola Marymount, UCSD, SDSU, Cal Poly SLO, Arizona and Arizona State. The Bruin squad of the early ‘80’s will be remembered as the most successful UCLA lacrosse team to date. In 1979, Greg Curtain was a freshman phenom from Daniel Hand High in CT playing on the first midfield line for a strong Brown program. Ned Dibble was another highly recruited freshman prepped at the Taft School anchoring the defense for the Wesleyan Cardinals. Bob Rich was a star senior defender at Springfield College, and Jon Reed was an All-American middie at Dartmouth. Dave Shay was finishing his high school senior year on Long Island, and Eric Resigno was lighting up Nor-Cal as a star attack man at Novato High. In 1980, all 6 arrived in Westwood and joined the lacrosse team. Curtain trasferred because his dad was a Navy Captain and his new ship was in the Pacific Fleet. Dibble muttered something about ‘majoring in blondes’. Reed was studying to be a spook, which explains why we never hear from him, and Rich was getting a Masters in Kinesiology, which is why we all called him ‘Doc’. Bruin fortunes changed for the better. With 6 formidable players, Bruin lacrosse became a force in the western states league, but it wasn’t until 1982 that the lines filled out and the Bruins could beat the loaded UCSB team and the emergent San Diego and Arizona teams and sweep through the California Collegiate Lacrosse Association Southern Division regular season culminating with an impressive defeat of UC Santa Barbara in the Southern Division finals. The Bruins took home the conference title at Crawford High School in San Diego the following weekend. This remains the last Bruin team to be crowned conference champions. In the spring of 1997 the WCLL was among the original 6 independent collegiate leagues which came together to form the first ever USILA Collegiate Club National Championships. The six leagues agreed to certain minimum eligibility requirements and agreed to send their conference champions to the new national championship in St. Louis. The leagues all kept up their own organizations, identites, records, and structures. In 1998 the USLIA (United States Lacrosse Intercollegiate Associates), now the USL-MDIA (United States Lacrosse- Men's Division Intercollegiate Associates), was formed and ran the national championship under US Lacrosse. Prior to the 2005 season the WCLL "A" was realigned into four divisions. The UCLA Bruins are currently a member of the WCLL Los Angeles Division. For a complete history, please see the record book below.